“Power is adequate for reaching freeway speeds with relative ease, and engine noise is minimal even at full throttle. 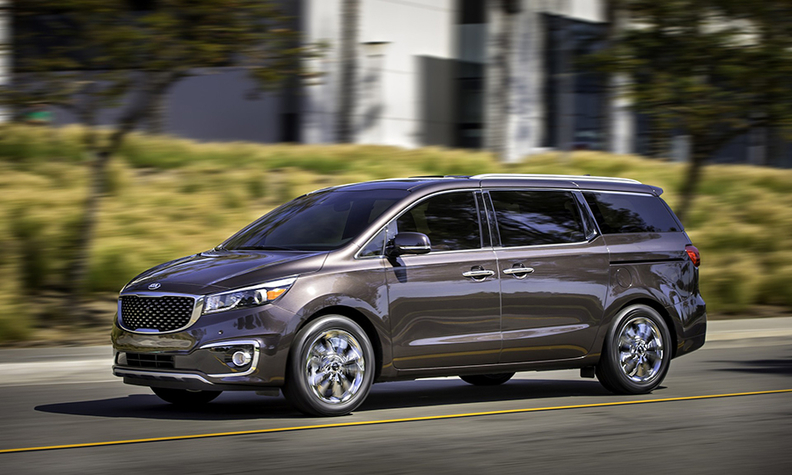 During instrumented test runs, the 2015 Sedona accelerated from zero to 60 mph in 7.9 seconds, which is just slightly quicker than the 2014 Toyota Sienna we tested last year. Manual control over the transmission is available by toggling the shift lever to the left from the Drive gate, although most minivan drivers will keep it in automatic all of the time. “How many hamsters can you fit in a Sedona? Eight, with the middle row that tucks out of the way -- or seven, with new ‘First Class’ lounge seats that transform into cut-rate Barcaloungers. If you move everything out of the way, you can conceivably fit in the back 142 cu. ft. of whatever you want to throw in there.